I cant believe we're on challenge 27 already at CSAYL! I should take a photo of my Christmas card bin, as it is getting very full! For my card I chose the Flaky Friends set. I love these snowmen! They are just so fun! Once again I went with a simply layout, as they are my favorite :) These snowmen are just so darn cute that I didnt want to get distracted with a lot of elements on the card. What can I say, I'm just a simple type of gal! I used dimensionals to pop up the snowman and stickles along the bottom of the snowmen. Hey Lisa! Ooh, I love your Christmas decorations!! Oh, I can't wait for Christmas. . .it's such a fun time of the year. 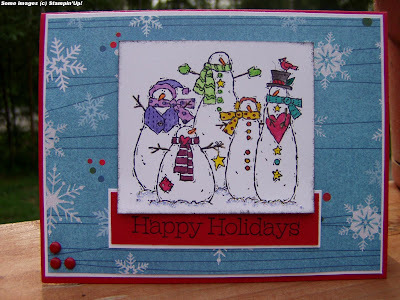 I love that SU snowmen image. . .it's one of my favorite stamp set...they're perfect for Christmas cards! Thank you for playing in the challenge again this week. It's always fun to see your cards each week!